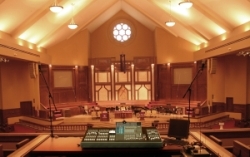 A view of the sanctuary at Christ United Methodist Church, with the Yamaha M7CL-48 digital console at the balcony operator position and McCauley line arrays flanking the stage. Christ United Methodist Church in Jackson, Mississippi, the denomination’s third-largest church in the U.S., offers worship services that regularly feature a 150-person choir and an orchestra of up to 80 pieces in addition to smaller ensemble groups. The backdrop for all of this is a beautiful sanctuary with a tough acoustical environment. The space is chocked full of granite staging, stained glass, travertine surfaces, expansive gypsum walls and 1,600 wood-backed seats. 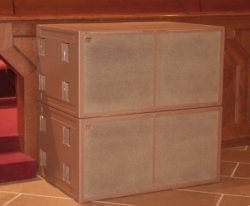 While the worship sanctuary has only been open for about seven years, the original sound system was proving inadequate in terms of coverage consistency of the entire space, and lacked both commensurate intelligibility and musicality. 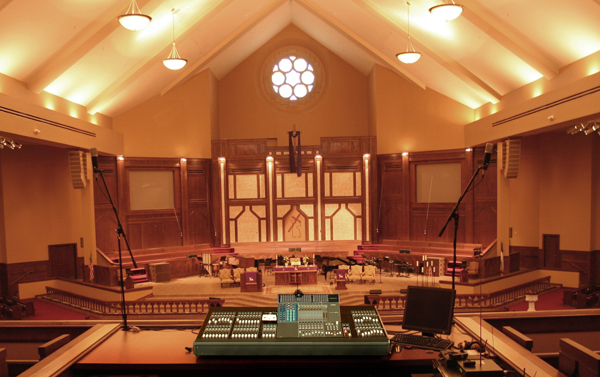 Chuck Weatherford, the minister of music at the church, contacted Howard Reitles of Harrd Road, a design/install and touring sound company based in Carlsbad, California, to discuss solutions to the churches acoustical needs. Chuck and Howard share a long association of collaborating on church sound system upgrades and retrofits. “The original system was proving completely inadequate for the space,” explains Weatherford. The sanctuary is fan-shaped, far wider than it is deep, with an elevated second level of seating running the entire width at back of the room. A 100-foot wide front platform anchors the front of the room, with a “steeple” ceiling running down the heart of the listening area. McCauley IN.LINE line arrays and flown subwoofers, all painted a custom color to match the surroundings and suspended with custom brackets. off the walls and ceiling,” Reitzes says. Reitzes worked with the McCauley Engineering Group in designing the audio system for the space. 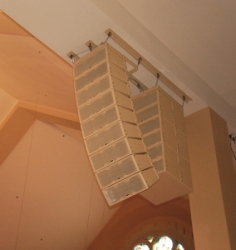 The use of IN.LINE installation line array modules with 3 variable horizontal coverage patterns allowed the engineers to develop a coverage pattern specific to the space. The main system is comprised of two IN.LINE arrays flown to the left and right of the wide platform. Each array consists of four N90 (90-degree horizontal dispersion) atop five N120 providing wider (120-degree horizontal dispersion) to better cover the nearer seating areas. The arrays were processed in 3 zones to allow slight gain shading from the top to the bottom and phase alignment. Both of these modules are 2-way designs with twin 8.8-inch cone drivers and a 1-inch-exit extended high frequency compression driver mounted to a proprietary waveguide. 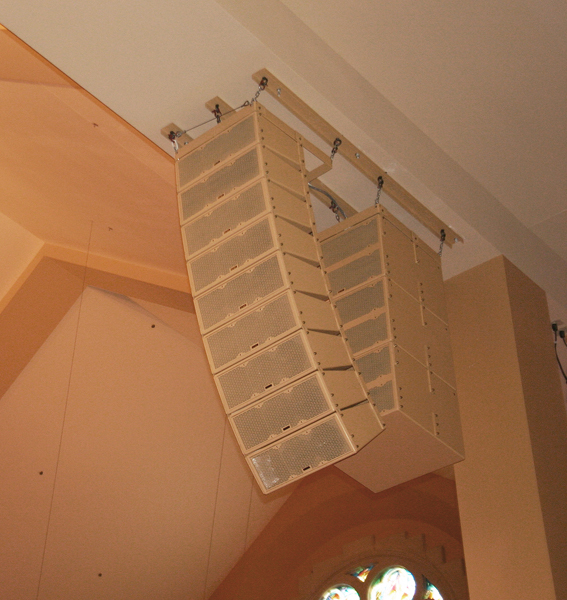 Three McCauley NS1 dual 15-inch subwoofers were installed directly behind each array with a McCauley Sound NB1 rigging frame connected to Harrd Road fabricated custom ceiling mount so that the main and sub array could work around support issues. “The subwoofers are behind the arrays due to space constraints, with the non-directional output of the subs unaffected by this location,” explains Reitzes. McCauley M88 dual-18-inch subs, stacked in pairs on the floor, add impact to the low end. Eight more iD2.208-96 provide delay coverage to the balcony, with their 90-degree by 60-degree waveguides rotated. The cabinets were mounted horizontally with the corresponding iDB.208-HU horizontal installation brackets. Further low-end energy is supplied by four McCauley M88 high performance dual-18-inch subs, stacked in pairs on the floor to the left and right of the platform. All loudspeakers and subs were custom painted by McCauley to exactly match the aesthetics of the space. Loudspeaker control and signal processing is supplied by two McCauley M408 4-input, 8-output loudspeaker controllers offering a wide range of functions, including FIR filtering, low-and high-pass IIR crossovers, virtually unlimited equalization, delay, compression, limiters, and much more.The loudspeaker controllers reside in an equipment room behind the platform, rack-mounted with the system’s Lab.gruppen power amplifiers. The loudspeakers are driven a total of three Lab.gruppen C-88:4, two Lab.gruppen C-68:4, and a Lab.gruppen C-48:4. 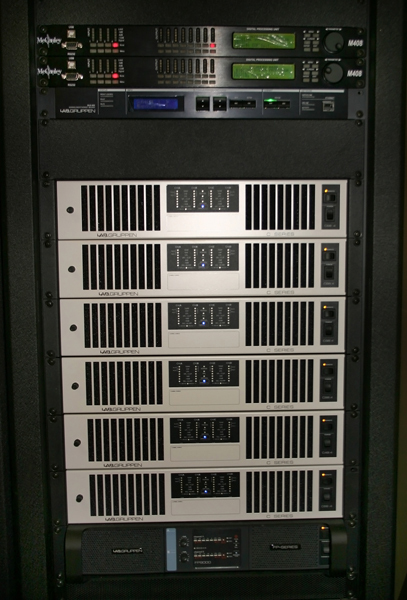 All of these amplifiers offer four output channels and tremendous output from a 2U package. 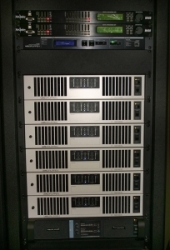 A single Lab.gruppen FP 9000, optimized for low frequencies, capably drives all four of the subs on the floor. A new Yamaha M7CL-48 digital console anchors the system operator position at the front/center of the balcony, and it does double-duty with both main and monitoring systems. The multi-channel Lab.gruppen C Series power amplifier and FP 9000 that drive all loudspeakers, joined by McCauley M408 digital processors. and wood wall, and below an 80-foot peak in the ceiling. “Coming up with a monitoring solution that wouldn’t reflect against the surfaces was a real challenge. It ended up that ‘lots of small’ was the ticket,” explains Reitzes, who specified 30 Nady PM-100 compact powered personal monitors under the seats to meet the application. Other mic needs are filled with a variety of Shure dynamic microphones (SM58, SM57, SM81), Shure UHF-R wireless systems, and DPA 4088 headband (dual over-the-ear) cardioid mics. Shure PSM Series personal wireless monitoring systems are used by the music and choir directors. The Yamaha console is outfitted with an Aviom output card to deliver the digital feed to Aviom A-16II personal monitoring mixers utilized by the ensemble/band members. A six-day installation window meant a tight, tough schedule of 14-, 17- and even 22-hour days, but within one week, Sunday morning services commenced with dramatically improved audio quality and dramatically improved coverage consistency. Thank you PSW Staff for the Original Article.